By all accounts, the Ebola virus is horrid and not to be taken lightly. Today, it was confirmed that this highly contagious and often fatal disease has reached the United States. No doubt, this story will be in the news for days. Christians, let us not overreact. Or, more accurately, let us not think it worse just because it has crossed our borders. This outbreak started months ago for our brothers and sister in Africa. I understand that physical proximity can make it seem more threatening. But, let us not show greater concern for that reason. After all, our love ought to be without borders. Ebola needed to be cured everywhere and for everyone. It's been a hard week. We agreed to watch 2 year old and 4 month old brothers while mom found stable housing. Peggy picked them up on Tuesday morning. Twenty four hours later, we were done. Don't get me wrong, they're good boys. But they're still boys. Two year olds are fun: they climb, run, jump and "play" with the puppy. In short, they require full-time attention. Four month olds eat, poop, cry, and never seem to sleep quite enough. Oh, and in this case, he also spits up -- a lot. None of that was necessarily surprising. Maybe that's why our decision was so hard. We should've known better. Late Wednesday morning, after a night with little sleep and a morning trying to keep the boys quiet so I could take conference calls, Peggy was emotionally exhausted. By the end of the day, Zack, our puppy, was growling at the two year old every chance he got, the two year old was crying inconsolably for his mom, the four month old was screaming at the top of his lungs, and Bella was crying because she wanted her mommy back. At one point, Luke, always the trooper, stood between the three younger ones with a panicked look, trying to figure out how to make the chaos stop. Though this post may sound like I'm complaining, that's far from my intent. Rather, I want to commend the single parents out there. And, I want to encourage everyone to empathize and lend a hand. Between Peggy, Luke and me, we had the younger ones covered; yet, we felt like we were drowning. And this was after only 36 hours. Single parents do this every day, every night, with no relief in sight. If you are able, offer them that relief. It may be through organizations like Safe Families or it could just be a call to a single parent offering to babysit for a night, or two. On Thursday morning, Peggy had brought the boys back to their mom. We fell short of the two weeks that we'd promised. We knew it was the right decision, but that didn't make it any easier. My real mistake was in agreeing to take the boys without fully assessing our situation. With a new home with hard floors and a pool, new puppy, working at home full time, Luke/Bella trying to adapt to a new place and school -- we accepted two boys who deserved more of us. Even after realizing that we needed to return the boys to their mother (or have Safe Families find another host family), we asked ourselves whether we were being faithful servants. 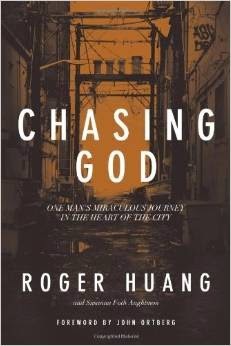 Peggy and I have been reading Chasing God, about a couple who, by their faith, dedicated their lives to the downtrodden in the Tenderloin District of San Francisco. Pastor Huang and his wife Maite have been in ministry for almost 30 years; and, yet, we couldn't give even two days to these two boys and their mother. What we had to realize was that full time childcare is not our calling. To serve those boys and the mother right, I would need quit my job. Otherwise, I was being disloyal to my employer and unfair to the boys in trying to serve both at the same time. The mistake, in this instance, was in running too far ahead of God's will and trying to do too much. Will we continue to serve with Safe Families? Without a doubt. Peggy offered to take the boys for a day or two at a time to give the mother relief. Weekends are fine. Older kids may even be okay -- especially if they're in school during the day. Serving God, we've learned, requires more than recklessly throwing ourselves at a need. Sometimes, serving God means being faithful in our current circumstances while remaining watchful for His calling. It's hard to stay with someone that long. You'd have to get married early (by today's standards). Both husband and wife would have to live to their 80s. In thinking back now, I realize I missed the most important point. Mom and dad didn't stay married this long just because they happened to marry early or that, by the grace of God, they've lived this many years. They've stayed married because they took their vows seriously. The covenant (of marriage) is valued. The idea of keeping our word is almost viewed as old-fashioned and those who insist on it as sticks-in-the-mud. Miss an appointment -- no big deal, we can reschedule. Late for a gathering -- it's okay, as long as we're not the last to arrive. Break a promise -- they'll understand that I meant it when I said it. Individually, they may seem like minor, isolated incidents. The problem is the slippery slope effect. As we justify each situation, the value of our word erodes. Further, the nature of justification is that it's one-sided; in our minds, what we've done is excusable. I don't say this claiming to always keep my word. My wife and children know that I don't. What I would like to demonstrate for them and others, though, is that it's a big deal to keep my word and a bigger deal when it's broken. When I promise to take Luke on a camping trip and fail to do so, it grieves me. I seek his forgiveness. I want him to understand that I don't take it lightly and will seek to do better. Peggy, my wife, is very forgiving. When I promise to do something, I know that my failure will be forgiven. But that shouldn't make it easier for me to break my word. Or, if I'm not certain I can keep it, I won't promise it. Mom and dad have offered us a wonderful legacy. They've chosen to keep their vows. They've lived through trials in such a way that the choice doesn't even seem like a choice; the alternative was never considered. By God's grace, I pray to continue such a legacy in my marriage but in everyday dealings. The Holy Bible: Holman Christian Standard Version. (Nashville: Holman Bible Publishers, 2009). Pr 3:3.